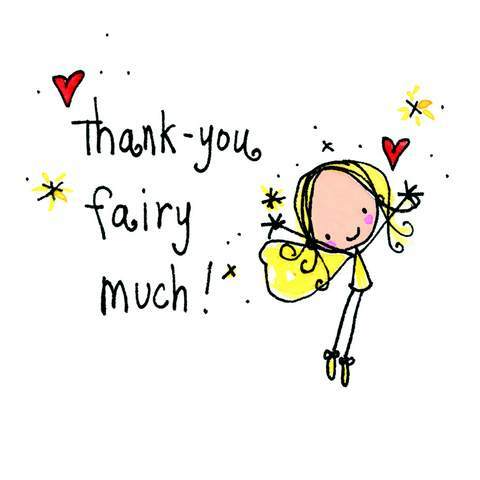 Our grateful thanks to all of the following friends of Ema, who have made her upcoming surgery possible. It’s simply been overwhelming how many people have reached out to help one tiny little dog. By the way, I’m attempting to keep this list as current as possible, but please forgive me if I’ve missed you – it was not intentional. We have good news – Ema’s surgery date has been moved up even closer, to October 20th. She goes in at noon on the 19th for pre surgical consultation, and then surgery on the 20th. This was made possible by the family of a Bulldog who was originally scheduled for the same day, for the same procedure, but agreed to swap dates with Ema, since her condition is more severe. Yet more proof – Bully people ROCK. 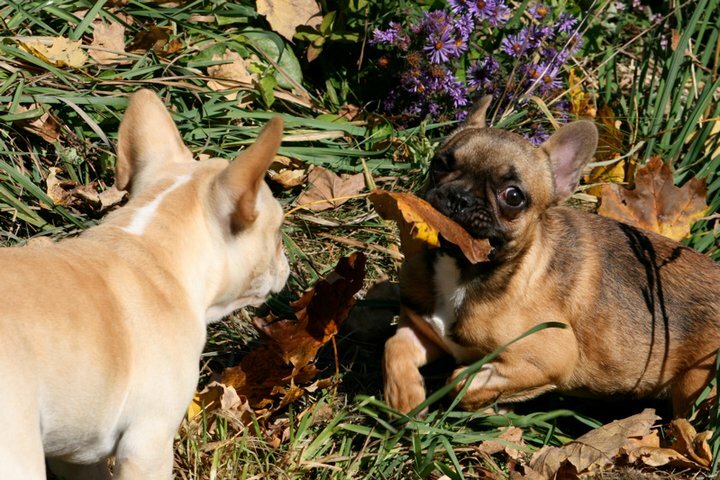 Sometimes, it seems like just yesterday to me – a time when no one knew what a French Bulldog was. If you were walking one, the most common question was “Is that a Boston/Pug/Bulldog?” (quickly followed by “did you crop his ears?”). If you wanted a Frenchie, you had to search for one, and you had to be prepared to wait. I searched and waited almost a year for my first Frenchie, and my first show Frenchie was a year and change search that had me flying cross continent into the buckle of the bible belt. In rescue, a single dog in need was a big deal – big enough that we all knew the back story, where the dog had come from, what it had been through. 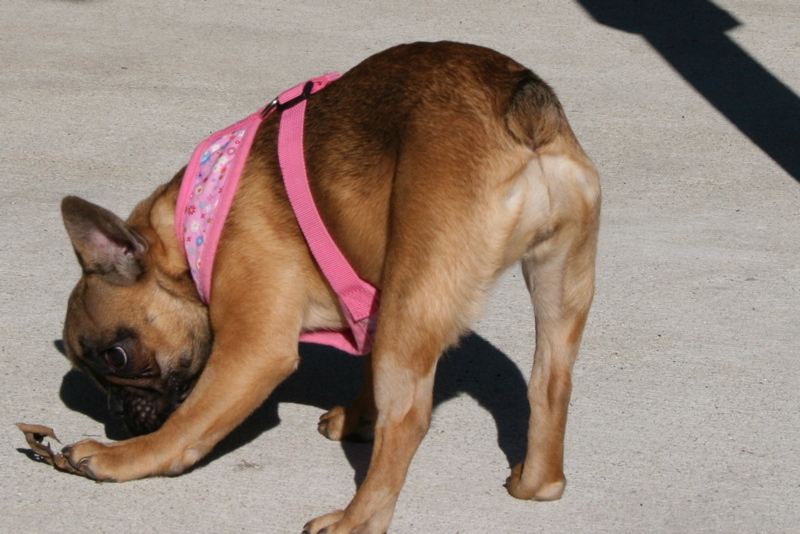 If you’ve been around for a while, you remember the story that shocked all of us to the core – the little puppy mill Frenchie who’d been living in a chicken coop, one ear cut off, possibly to get rid of her identifying AKC tattoo. A rescue was usually just that – a needy dog, taken out of a horrible situation. 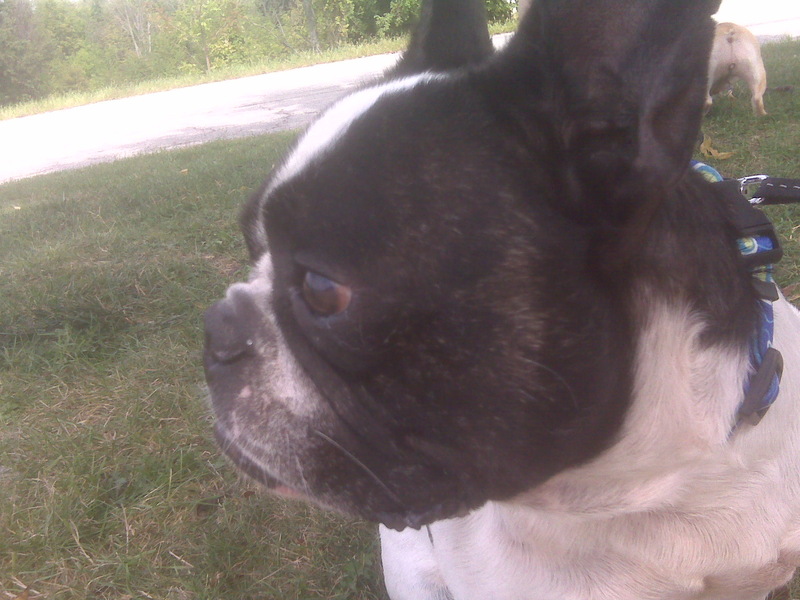 There weren’t many abandoned or unwanted French Bulldogs, even fewer strays (I can’t recall any, actually, or if they were strays it was only until their frantic owners tracked them down). Times have changed for our breed, however. You can’t look at a rescue page without reading about a French Bulldog dumped at a shelter, or given up by an owner who doesn’t want it any more. Even the “rare” Frenchies are turning up in rescue now – FBRN has had a Blue French Bulldog or two in their care, given up by owners who apparently didn’t place value on either their dog, or the $6,000 they paid for him. We even have strays – dogs found wandering, and unclaimed. French Bulldogs that no one bothered to look for. Inconceivable, not very long ago – common place, today. CJ is one of those dogs – found wandering on the streets of a southern town, CJ ended up in a pen at a kill shelter, just one more dog that no one wanted, and that no one bothered to look for. CJ’s time was running out, but the French Bulldog Village won him his freedom, and he made the trip north to Canada, along with Peanut. CJ has been fostering with FBV/ECFBC Rescue Volunteer Karen, in Beamsville, Ontario. I met CJ, and I envied Karen getting to share her house with the big galoot. CJ is all happiness and affection – a leg leaner, pressing against you for comfort, smiling his big goof ball Frenchie grin at everyone he meets. His back legs are wobbly, and he has the occasional accident, but he’s a good boy at heart who tries his best to make you happy, and who we were optimistic was going to make someone a fabulous companion. Then, over the past weekend, CJ became ill, vomiting and unable to keep his food down. When he stopped eating, foster mom Karen knew something was very wrong, and rushed him to the vet’s office. What she found stunned her, and has stunned me – CJ has been shot, not once, not even twice, but at least three times. Embedded in his body are three BB Gun pellets, two in his chest and one in his leg. He has peritonitis, possibly from the perforation that one of the bullets left in his body caused. They’re going to have to open up his abdomen, insert drains and put him on IV antibiotics. Some time in CJ’s past, perhaps while he was wondering lost and alone on a dark southern street, someone saw him and, rather than wanting to help him or alleviate his fear, aimed a gun and shot him. Three times. There are moments when the very thankfulness and gratitude that I wrote about just two days ago seem to slip out of my grasp. There are times when I feel, when anyone who rescues can only feel, overwhelmed by the amount of cruelty that exists in the world. If you ever meet CJ, a little dog who only wants to make everyone his friend, look into his soft brown eyes – and now imagine, instead of being moved by him, deciding to aim a gun at him instead. CJ needs what we’ve already asked you for so recently – CJ needs a miracle. His vet bills are $1,100.00 so far, and he’s on his way to the University of Guelph (where Ema will be receiving her surgery). Their estimate for his care is $1500 – $2,000. If you can help CJ, please visit his page on the French Bulldog Village website, and click the paypal button at the bottom of the page. Again, as with Ema, every dollar counts. In our own tiny attempt to fund raise for CJ, I’m going to do something I’d always said I never would – I’m going to put ads on my blog. If you donate $250 or more to CJ’s care, I’ll place your banner on the bottom of every post on my blog, for six months. A pretty good deal, since we get well over 30,000 visitors a month. What a bargain! Make your donation via CJ’s paypal button, and note that you want to run an ad on this blog, and I’ll get it set up. Heck, I’ll even design the banner for you. Ads are limited to three, due to space considerations. Do you have your own fund raising idea for CJ? Tell us about it – let’s try to get this big happy boy, who’s had such bad luck with the people he’s met in his life, that there are people out there who care. If you can’t donate to CJ’s care, please please – spread the word about him. Share his story on twitter, facebook or on any mailing lists you’re on. CJ needs a miracle – let’s be his angels. If I haven’t managed to convince you yet, watch CJ’s video – and now remember those bullets. An upate: Ema has a surgery date – October 27th! I am especially thankful for this, and I’m trying to think of the two week waiting period as a time of reflection and grace. I have numerous things that I am thankful for every day, but this year seems especially poignant to me, because this year I have Ema. I am thankful that Ema’s original owner was willing to turn her over to rescue. I am thankful that he reached out to us, that he was willing to take the time to search for us on the internet, make contact, and to allow us to take custody of her. I am thankful to everyone who reaches out and asks for help from a rescue, rather than just dumping their pet at a shelter, or selling them on Kijiji. I am thankful to Eva, who drove across country, seventeen hours each way, to rescue a puppy she had never met at the request of people she didn’t know. Eva is testimony to the power that the internet can have to be so much more than just entertainment – she is testament to how we are all building communities, making bonds and even sometimes making a difference. I am thankful to every rescue volunteer who has ever offered to drive, foster or care for a dog in need. I am thankful to Ema’s first veterinarian, Dr. Melissa Boyle, who knew enough to say to us “I don’t know what’s wrong with Ema – let’s send her to someone who can help”. In a time when so much of what we read about veterinarians is dismissive, or accuses them of being money hungry, Vets like Melissa restore my faith in the veterinary profession. I am thankful for Dr. Minors, another veterinarian who gave of her time and her expertise to help Ema, and who gave us answers to the hard questions about her health and her heart. I am thankful, even more so, for Dr. Minors’ willingness to donate her time to Ema, when she didn’t have to and wasn’t even asked to. I will remember Dr. Minors everytime someone tells me that all vets are just mercenary opportunists, and I will be thankful that I know this isn’t true. I am so very, very thankful to every single person who donated towards Ema’s care. Without you, I wouldn’t be sitting here anticipating Ema’s surgical date – instead, I’d be sitting here worrying about whether or not we could afford to pay for it. I am thankful to all of those people who said “I wish I could send more”. I am thankful to every child who said “this is my allowance, for Ema”. I am thankful to everyone who said “I want to help to save her”. We are told, every day, that the internet is making us all more distant, that it has made us lose our sense of community. I don’t believe that, and I don’t think you should, either. I am thankful to every blogger and Facebook friend who helped me to share Ema’s story, and who keep up the good fight for all of the dogs in need. Sometimes you might think “I can’t do anything to help rescue”, but every time you share a story, tweet about a dog in need, write about a rescue fundraiser and help us to get the word out there, you ARE part of rescue, and a valuable part that I am thankful for. 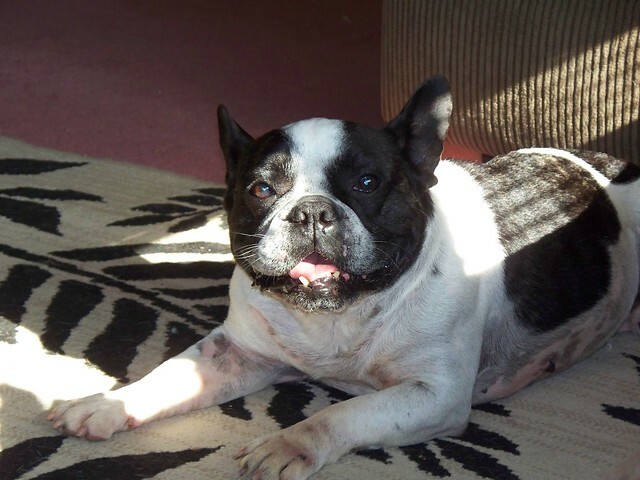 I am thankful to Charlotte Creeley, and to the French Bulldog Village, for stepping up and saying “We’ll help care for Ema, if your rescue can’t afford to”. Charlotte and FBV are a beacon of hope to the French Bulldogs that would otherwise have no one to champion them. I am thankful that Charlotte is a friend to French Bulldogs, and even more thankful that she’s been a friend to me and to my dogs over all of these years. I am thankful to Sean, who had NO idea what he was getting into when he started to date me, even after I’d warned him that the dogs come pretty much first. I am thankful that, no matter how many times I’ve said to him “We need to take care of another rescue”, he’s never said anything back to me but “How can we help?”. I am thankful to Ema, and to every other rescue I have ever taken care of. They have taught me patience and fortitude. They have amused me, touched me, made me laugh and sometimes made me cry. They have allowed me to see the very best in people, even if it means I’ve also had to see some of the very worst. Caring for foster Frenchies is a gift, and I am thankful for it every day. They add to the joy that I get from my own dogs, and they make me even more comitted to this breed, and to the friends I have made through it. I am thankful for time. I am thankful for every day I have with Ema, and I know every day is a gift and a blessing. I am thankful to be able to share time with Ema, and to have time with her. Ema has taught me to think in terms of moments and seconds, not weeks and years. I am thankful for that, and I am thankful for her.